Today I want to spotlight a very special vendor friend — a name, a brand, almost synonymous with the classic steps and soaring ceilings of San Francisco City Hall. I’m talking about Amanda Wei Photo (AWP) and their team of kickass shooters. These ladies are incredibly professional and super friendly. Their craft speaks for itself. They do such a wonderful job of making our couples at-ease and so natural in these photos. These couples practically glow! We’ve had numerous referrals from AWP, so I wanted to highlight just a smattering of weddings we’ve done in the last year. First up is Katie and Kevin, who requested a merlot bouquet for their New Year’s Eve nuptials. I love how our moody flowers pop against the lovely detailing on Katie’s dress and the grandeur of City Hall! This bouquet is full of cymbidium orchids, peonies, roses, ranunculus, and a touch of hellebores. Next up, we have Kate and Greg, a Southern couple with the cutest Southern charm! Kate’s dress was stunning, and we made sure our white and green bouquet didn’t compete too much with that dramatic neckline and full-length veil. I loved that they had a traditional second line waiting outside City Hall to congratulate them as they exited. Now that’s an exit. For this wedding, we focused on different textures and shades of white to build dimension, incorporating peonies, garden roses, ranunculus, anemones, lisianthus and veronica. Last and certainly not least, Sandy and Chris celebrated their wedding day with their pup Penny! And if you follow our Instagram, you know we can’t get enough of #dogsandflowers. This elopement was just so sweet - the flutter of peach ribbons, a hint of peachy-blush in the flowers - all perfectly pairing with the flesh-toned bodice of Sandy’s dress. To die for! Three different weddings, all shot by the same AWP team. If I haven’t already convinced you yet, make sure to check AWP out! You won’t regret it! Also, if you are ready to take the dive and need flowers your your elopement or engagement session, check out our Shop for all the details. When you hear California Wine Country, you probably first think Napa or Sonoma. But did you know that just outside the Bay Area, on the other side of the Diablo Range in the San Joaquin Valley, there is a quaint and cozy wine town called Lodi - full of approachable, friendly vineyards growing all sorts of red varietals. Our next couple, Annalisa and Adam, chose to get married right in the heart of Lodi at St. Anne’s Church and the charming inn of Wine & Roses. Scroll for more pictures of their day! For the bouquets, Annalisa and Adam chose a pretty blush and cream color palette to pair with the white and navy dresses. We filled the bouquets with fragrant garden roses and stock flower; ruffly dahlias and unique anemones; bushy protea and whimsical veronica for texture; and lots of greenery to fill in the spaces. For the reception, we created the longest floral table runner we’ve ever made, at nearly 22’ long! The massive head table seated 18 people, and no matter where you sat, you had a pretty view of the floral runner, full of dahlias, roses, hellebores, carnations, and tulips. The remaining dining tables had an assortment of garlands or floral arrangement. And finally, the pièce de résistance was the 3-tier wedding cake - so absolutely simple except for the additions of the cute little flowers. I thought the garden spray roses and mini ball dahlias were just the perfect touch to the cake. Wishing Annalisa and Adam a lifetime of happiness! And many thanks to Mason & Megan for the darling photos! As if one wedding day wasn’t incredible enough, this next couple had a TWO day wedding. We were so lucky to be part of both, helping with the flowers and day-of-coordination. Scroll more for this two-part wedding. Trang and Bao are highschool sweethearts, and they both really wanted to have a blended wedding to honor their Vietnamese American Catholic heritage. Day 1 of their wedding was a traditional wedding complete with tea ceremony, church ceremony, and big banquet dinner. Their dinner entertainment even featured a stunning drum performance by their dance group. The young couple also made a cameo appearance in a choreographed dance number! Day 2 was a laid back affair at the Fitz Place in Morgan Hill. Their guests played fun lawn games, ate delicious BBQ, and ended the night with a wild silent disco. The groom and his merry groomsmen were barely standing by the end of it! What a fun way to close a weekend of festivities. Thanks so much Trang and Bao for having us part of your day, and wishing you both a lifetime of joy, laughter, and happiness. Also a huge shout out to the great vendor team, linked below! I think I’ve mentioned this before, but we do zero advertising, which means all our couples are referrals from previous clients and other vendors. This makes me exceedingly happy as there isn’t a better testament of our client’s trust than entrusting us to their family and friends network. This next couple came to us through a referral (the bride’s sister! ), and you’re in for a lovely treat with these gorgeous photos by the talented Jasmine Lee. 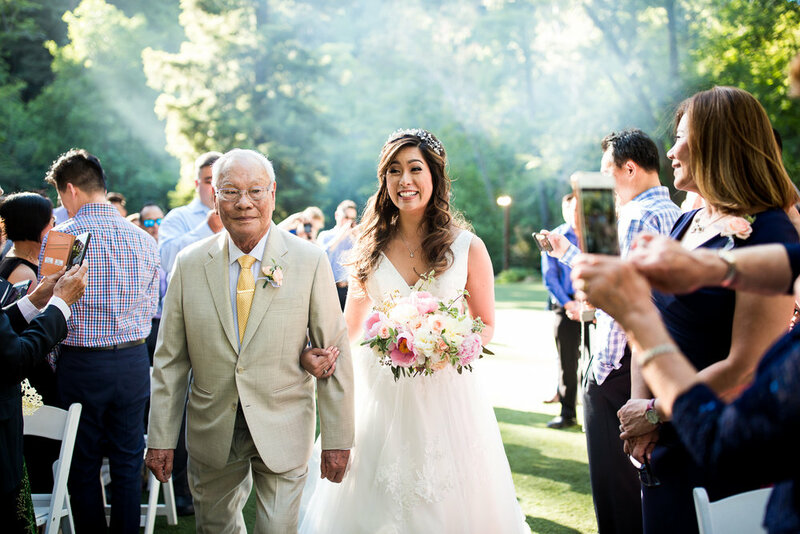 Emily and Vincent were married amongst the grape vines at Wente Vineyard in Livermore, CA. They selected a vibrant and feminine color palette, with a range of bright pinks and soft creams. Emily’s bouquet featured the most stunning peonies, garden roses, lisianthus, ranunculus, blushing bride protea, astilbe, scabiosa and carnations. We added explosion grass and eucalyptus for some fun texture. Doesn’t Emily look stunning in BOTH her wedding dresses? So much pretty! I especially love how the cascade of ribbon looks against her reception dress. To die for! For the ceremony, we created an arch to frame our couple, and per the couple’s request, added strands of fluttering satin ribbon. I thought the overall effect was unique and so, so pretty. The arch featured many stems of smilax and eucalyptus to create a full and organic look, and we topped it all off with different types of pink roses. Moving to the reception, the dining tables were adorned with garlands of eucalyptus and olive and lots of pillar candles. The sweetheart table made a huge statement with the lush floral arrangement we created. And just a few feet away was the showstopper - a beautifully simple but elegant wedding cake. Hope you enjoyed this wedding as much as I did working it! This next wedding is straight out of a Disney movie. The couple, Phyllis and Ray, LOVE all things Disney, and to no one's surprise - had a Disney-themed wedding. That includes a princess tiara and princess gown; a woodland setting for their wedding; and plenty of other Disney references that would tickle the biggest Disney fans. See if you can spot all the references. To stay true to the woodland setting and Disney-theme, we kept the florals really organic and loose. We used lots of greenery, and incorporated pretty summer blooms like peonies and garden roses in bright shades of coral and pink. They really popped against the mint bridesmaid dresses and green forest canopy. 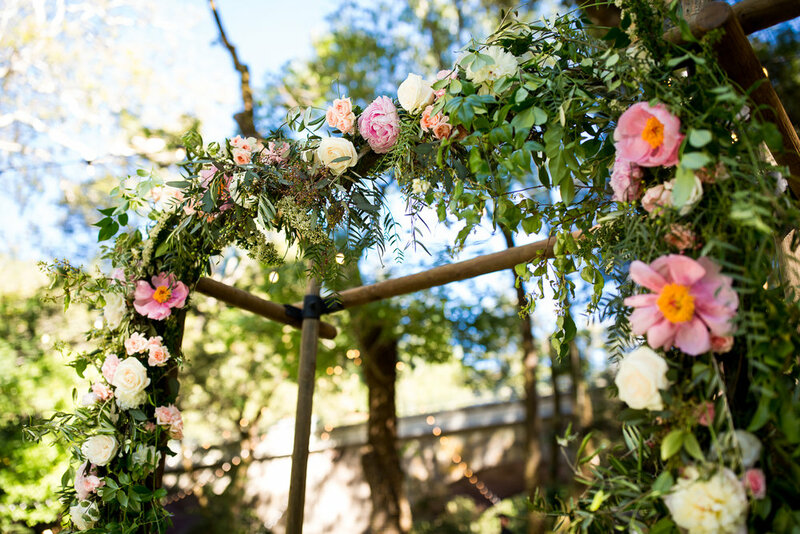 Our ceremony arch featured climbing passion fruit vines, graceful pepper berry branches, fun stalks of spirea, different varieties of peonies, garden roses, and carnations. The overall effect is fit for a princess, don't you think? I really loved all the little details from this wedding. And the venue was a dream! Wishing Phyllis and Ray and happy ever after! Thanks to our vendor team for making this event a success!